Android 4.4 system, WiFi and Bluetooth 4.0, multi-functional easy to use. High brightness 3000 lumens with 1000:1 contrast ratio for clear, razor-sharp images. With native resolution to be 1280 x 720 pixels and the highest resolution support 1080P to make it clearer. Manual focus adjusting get picture maximum up to 170 inches, and the distance of projection is from 1 to 5 meters. Features keystone correction function to get wonderful pictures. IR remote control powered by 2 x AAA battery (not included). Convenient operation of functional keys, convenient to operate. MULTI-FUNCTION: Android 4.4 system, WiFi and Bluetooth 4.0, multi-functional easy to use. 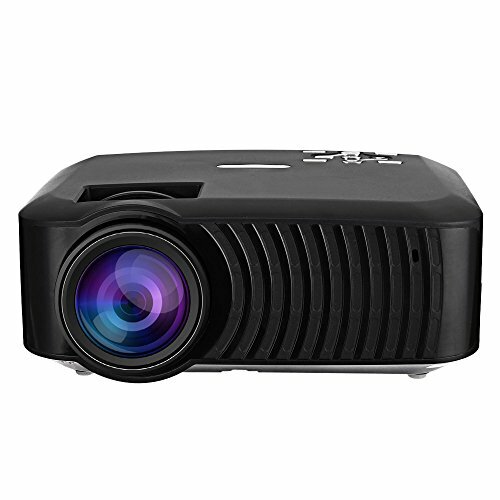 CLEAR IMAGE: High brightness 3000 lumens with 1000:1 contrast ratio for clear, razor-sharp images.With native resolution to be 1280 x 720 pixels and the highest resolution support 1080P to make it clearer. MEET ALL YOUR DEMANDS: Picture switch from 16:9 and 4:3 to meet your different demands.Manual focus adjusting get picture maximum up to 170 inches, and the distance of projection is from 1 to 5 meters. Features keystone correction function to get wonderful pictures. EASY TO USE: Convenient operation of functional keys, convenient to operate. If you have any questions about this product by EARME, contact us by completing and submitting the form below. If you are looking for a specif part number, please include it with your message.